In his book Notre Dame -- 100 Years, Fr. 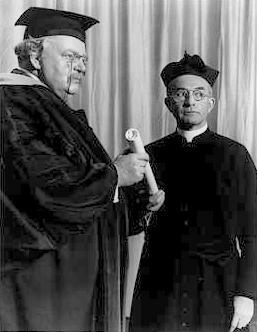 Arthur Hope, CSC, tells the story of Chesterton's lectures at Notre Dame -- his arrival, the impression he made, and the honorary doctorate he received before he left. In his works if not in his person we can regard him not as a mere visitor but as a permanent resident of Notre Dame. Chesterton's biographer, Maisie Ward, was also his friend. The Sheed and Ward Family Papers in the Notre Dame Archives contain correspondence and cartoons by Chesterton and a copy of a book he wrote and illustrated, Greybeards At Play. On its website, the Jacques Maritain Center at Notre Dame has the full text of a collection of Chesterton's sayings, Chesterton Day by Day. The Notre Dame Archives has a typewritten manuscript of Chesterton's Autobiography. Among the Special Collections of Notre Dame's libraries, John Bennet Shaw's G.K. Chesterton Collection contains over 2,000 books and periodicals by or about Chesterton.